You may have seen it before in various permutations, with the order changed, or with extra things added or taken out. The point is – the basic principles to this are exactly the strategy you need to take with your SEO if you want to make a serious amount of long term sales from this game. But it’s probably the most important part! Sorry to say – That’s not content! And you’re setting yourself up to get whacked with a penalty by Google. And/or a hammering at the rankings when Google does their next algorithm update. You need to provide some sort of value for your potential audience. What kind of questions do they have? What keeps them up at night? What potential pain points might they have? This could be in the form of free advice, industry whitepapers, free app, eBooks, mega-informative articles, videos, podcasts, etc,etc. Hand in hand with this – make sure the content is accessible by everyone. Whether that’s someone using a mobile or desktop computer and to search engine crawlers. On-page SEO comes into play here also – so you’ll also want to make sure your site’s internal linking structure is spot on. 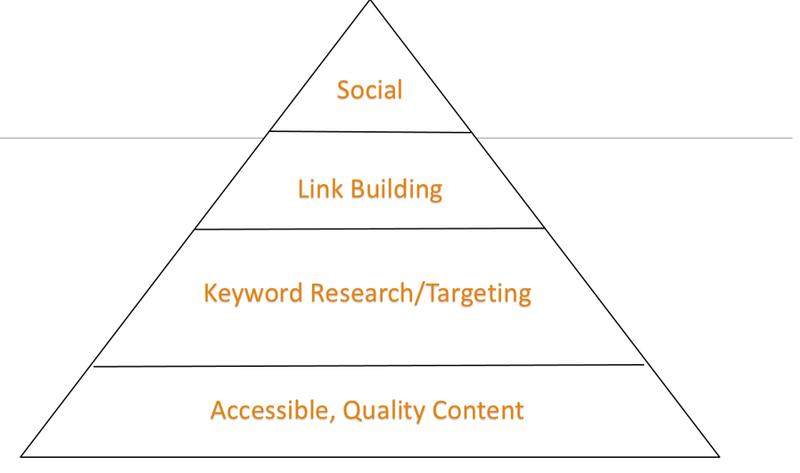 Just having great content won’t be enough though, it’s a great foundation to build on top of though, so lets move further up the pyramid to see how you can capitalise on a website loaded with great content. While we don’t want to be obsessing about rankings – You want to have an idea of the kinds of keywords you want to be targeting. So look at your competitors, look at the related and suggested keywords, perhaps keywords which you already happen to be ranking for and create a big list of these. Again, your on-page factors are very important here – done correctly, it’ll essentially point search engines in the right direction in terms of knowing which terms to rank your site for. So make sure the keywords are mentioned on the right pages, in the titles, in the URL, used as anchors etc. But… that doesn’t mean over-optimize! Keyword stuffing has been relegated to the past, so it’s equally important that everything looks as natural as possible as well. Here’s where you can really capitalise on the base of the pyramid. Think about where your target customers and audience may be lurking, what kind of site’s they’re reading and reach out to site owners or editors on those said sites. That could mean they have some content which has some crossover with yours, so they could link to your content directly to you from there. Or you may want to guest post for them and get a link back to your own site that way. Just as long as its a quality site and there’s relevancy, it’ll stand you in good stead. The more of these links you can get, the more traffic you can gather up and send to your website – and the more sales you should then make. Not always the major focus point of an SEO campaign, but a mode of marketing that shouldn’t be completely ignored – especially for an e-commerce business. Since you’ve built links at this stage and started to gather an audience through organic traffic, you can also engage with your audience on social media, or even retarget them with ads. Now and again, you may even have a piece of content which goes viral– social media can definitely play a part in enhancing this even further. The essential thing about this pyramid – each part can have an effect on a layer that’s further up. Ignore one part (especially when it comes to the foundations of on-page aspects or content) and you may find the whole strategy crumbles. Read it, loved it! Keep on the good work Amit.